Fingal’s Cave is located on the coast of the small deserted island called Staffa in Scotland. It is one of the most famous sea caves. This cave is primarily made of basalt columns, caused by volcanic action. These basalt columns are symmetrical and hexagonally jointed. It is also known as ‘an uaimh binn’, which is an Irish term. Its literal translation is ‘the melodic cave’. The floor of the cave is covered by about 25 feet of water. It has a width of around 40 feet. The entrance of Fingal’s Cave is an archway supported by basaltic columns which are 20 to 40 feet high. The cave was rediscovered in 1772 by naturalist Sir Joseph Banks. Sir Joseph Banks is responsible for both rediscovering and renaming the cave. It can be accessed by tourists by boat or by foot once they reach the island. Fingal’s Cave has been mentioned in various works of art and literature. The symmetric rock formation in the cave developed by the breakup of Pangaea. In ancient times, the cave was a well-known wonder of the ancient Irish and Scottish Celtic people. Matthew Barney, the famous American artist used the cave in his Cremaster cycle. The echoes of the waves produced eerie sounds in this cave and give it an atmosphere of a cathedral. The height of the cave is said to range from 20 to 23 meters while the depth ranges from 45 to 85 meters. Declan, Tobin. " 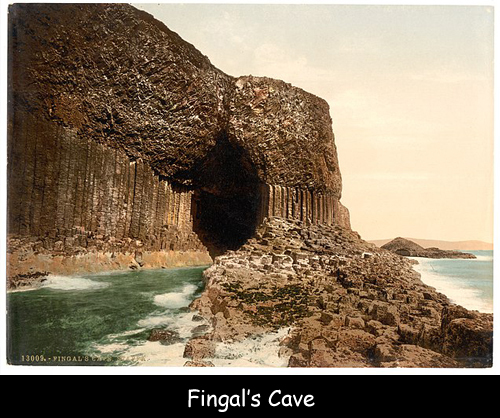 Fun Facts about Fingal's Cave ." Easy Science for Kids, Apr 2019. Web. 26 Apr 2019. < https://easyscienceforkids.com/fingals-cave/ >.